It seems almost as if we are back again where we started. That's not because history repeats itself, but because history, as they say, rhymes. When I first started, we took the example in "Its' a Wonderful Life," of what could happen if one greedy man, the banker in that story, Henry Potter, took over and owned everything in the town of Bedford Falls. That was to compare how everything in Brooklyn was being handed over to Forest City Ratner in Brooklyn (hence the visual above). It was only a small town in that fictional story. And it was only the Borough of Brooklyn in our comparison. . .
. . . Now, similarly, with much of the mechanisms repeating, Amazon is set to take over a swath of Queens. See: Amazon Headquarters Lands In Long Island City: What Happens When Our Elected Officials Hand The Task of Governing Over To A Private Sector Corporation, Monday, December 23, 2018. But that story has broader swath. Amazon is taking over everything, and it is doing so nationally. It probably is never more evident than during this season when the packages pile in to everybody's lobby. But if you read the article linked to above, there are free speech and preservation of public discourse concerns that accompany that Amazon takeover. 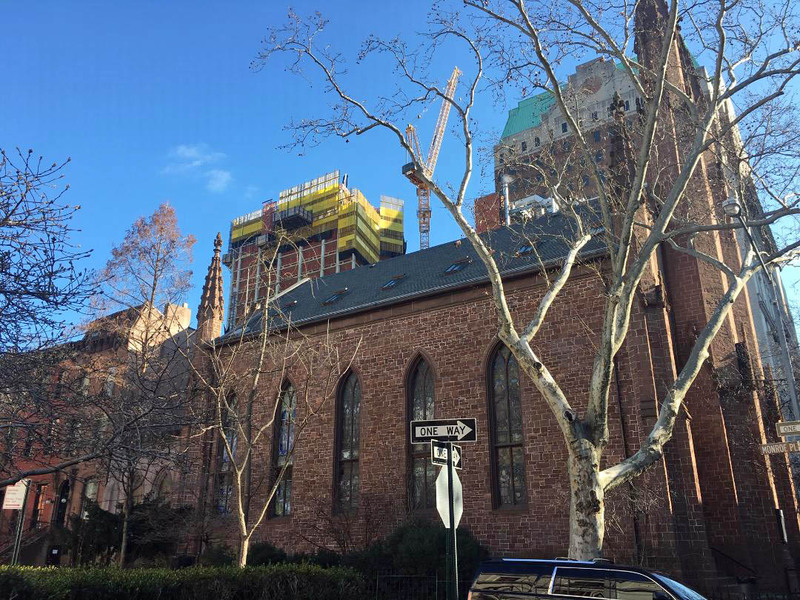 A recent sermon at the First Unitarian Universalist Congregation of Brooklyn by Minister Ana Levy-Lyons was about what it means for Amazon to be taking over. Last night we watched "A Christmas Carol" again, the definitive classic version with Alistair Sim. "A Christmas Carol" is among the several classic seasonal tales I've written about this time of year in these reflections. They are all thematically related, like the Grinch tale. Reverend Levy-Lyons' sermon echoed the lessons that we heard all over again as the spirits teach Scrooge in their visitations; the lessons that human beings and the value of life is rich and multi-dimensional, and that we are not fully human if we allow ourselves to be a hammered down to the thinness that, in the Amazon, world defines us as merely consumers looking for bargains at the cheapest possible price. Its confusing: The pre-transformation Scrooge was abstemious. . . And what are we supposed to be doing when confronted by Amazon? 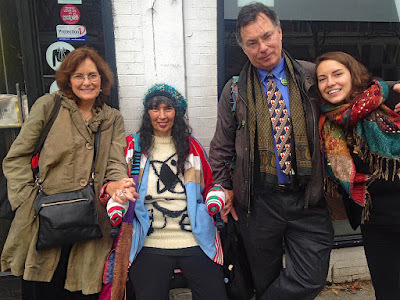 : Meditate on this and it might become clear– It has to do with our connection to other people, our connection to the general community and its welfare. 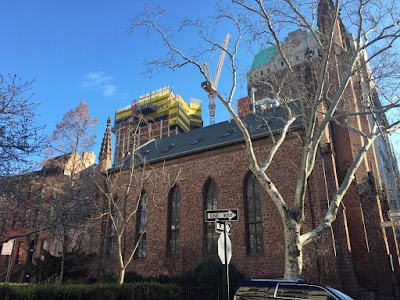 Corner of Monroe and Pierrepont- The luxury tower replacing the library, no about two-third complete, is rising up as seen behind the First Unitarian Universalist Church. What else is going on this season? The luxury tower that is replacing the Business, Career and Education Brooklyn Heights Library, the central destination federal depository library in downtown Brooklyn is going up now. At two-thirds complete it is getting to be evident how readily it will be seen from many parts of the neighborhood, like, for instance, it is now visible from the corner or Monroe and Pierrepont streets. 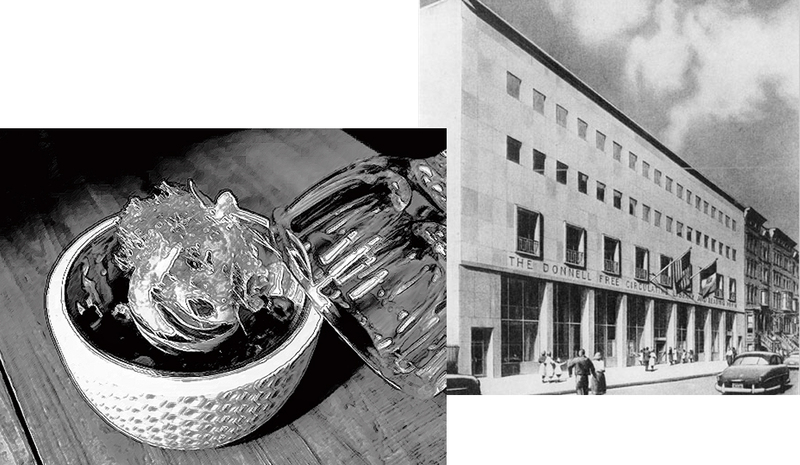 Monroe Street was a focal point from which the push to sell the library emanated. Meanwhile, we held community meetings at each end of Monroe to prevent that sell off. View from DUMBO waterfront of the luxury condo replacing the library, now tall enough to be seen above the nearby elevated roadway. As of this of this solstice, the semi-complete building was also casting long shadows onto Cadman Plaza Park. See: In This Winter Solstice Season, Long Shadows Being Cast By The Not-Yet-Complete Luxury Tower Replacing Brooklyn Central Destination Library. Just weeks ago we lost a library defender who fought along side us to prevent the destruction of that library, Justine Swartz, also known as Ambrosia. See: A Beloved Library Defender Is Gone, But Not Forgotten: Justine Swartz, Our Ambrosia. Christmas Day 2015, we ran into Ambrosia (in the seat of honor) on Montague Street. Another concern that is very present this year is an accelerating censorship and control of information. I had a chance to start writing about it here in October: On The Media Interview With Dean Starkman: The Difference Between "Access Reporting" and "Accountability Reporting" Explains How Very Important Things DON'T Get Reported- Plus Consider The Censorship Crisis, October 4, 2018. But, I have not been writing fast enough to keep up to write yet about Facebook's more recent censorship binge done coordinating with Twitter. So much censorship like that and suppression of information in our society suppresses the things that are anti-war, critical of the military and that might lead us in the direction of greater world peace. . . It's something to think about especially in this season when we sign cards to each other about "peace on earth." Since censorship is about control of information there is one part of this story that is huge in a meta-way, and that is how the Facebook censorship binge, abetted by the actions of other social media giants, has, itself, gone largely unreported or misrepresented, especially in terms of the censoring of anti-war and anti-authoritarian sources of information (including police violence accountability sites). That brings us around again to the subject of Amazon and the frightening thought that Amazon, with its origins in and ongoing ties to the military and CIA, now sells about half of all the books in this country, plus it is taking over as a key supplier of all the old and classic films we once rented from video stores. It's also scary how much Amazon, busily collecting data, knows about each of us, plus scary how little we, conversely, know about Amazon. I remember the young and tender age I was when I was horrified to have explained to me the concept of “the company store,” the store in the company-owned town, which was the only place to buy things, where those things were priced at a price you couldn’t really quite afford so you were perpetually in debt to the company, which was the only employer in town, that didn’t pay very much so that you could never earn enough to leave town. . . Peonage! My mind boggled at the concept— to be so unfree, cut off from any choice! Could such inconceivable traps have ever existed? Symbolizing how absolutely closed the system was, some companies even issued their own currencies, their own “money” or company “script” to pay workers’ salaries that they would have to spend at the company store. Safely in the past? : Just a few years ago, a division of Walmart (Wal-Mart de Mexico or Walmex) was doing this with its Mexican workers paying workers with vouchers, in lieu of cash, redeemable at its outlets until the Mexico’s Supreme Court ruled this violated the Mexican constitution. Imagine the way that a private corporation could once take over and become everything! These days Amazon, famous for paying its workers low wages, has just become the second biggest U.S. Company as of September 2018. We think of Amazon as having low prices, unlike the prices of the company store that were always too high, but it is becoming increasing hard to shop elsewhere and the real price we are ultimately paying may be an illusion as Amazon is allowed to run rampant as a predatory monopoly putting all other competition out of business. Amazon’s inescapability will be brought home for New Yorkers in another, yet more intense way now that Amazon is landing a “headquarters” in Queens’ in Long Island City. Flexing the musculature of its enormous bigness quite openly, we see Amazon being allowed to take over our city’s governance with New York state powers be turned over as well. City and state officials are aiding and abetting Amazon in the process are letting Amazon do that. That is thanks principally to Bill de Blasio as New York City's mayor and Andrew Cuomo as New York State's governor. The first thing you hear about Amazon’s plan to land a “headquarters” in Long Island City is that in exchange, to “lure” Amazon here, it will be getting an amazing glut of subsides including tax exemptions, from both the city and state plus the federal government as well. How much? : It’s clear that the amounts can only be spoken of in terms of more than a billion+ dollars multiplied by what? The estimates of the total subsidies (which we will have to come back to) range. As they were calculated and negotiated in secret and have not been thoroughly or openly vetted by any economists, we should not make the mistake others may make of pretending that we truly know much about this deal so soon after its revelation. There are even nondisclosure agreements about making much of this information public that apply to the future. The most fitting quick observation about these massive subsidies is that other tech giants, Google, Facebook and Twitter, all have very sizable presences in New York City with none of them receiving such subsidies. New York Times architectural critic Michael Kimmelman, who sometimes splits the baby trying to make happy both activists and the powers-that-be, made the embarrassing suggestion that rectification could be made with respect to Amazon’s arrival if Amazon invested in NYC’s “public libraries” and “local school programs.” See: Michael Kimmelman’s Unfortunate Suggestion That Amazon Invest In NYC’s Public libraries (per Eric Klinenberg)- See: “Amazon’s HQ2 Will Benefit From New York City. 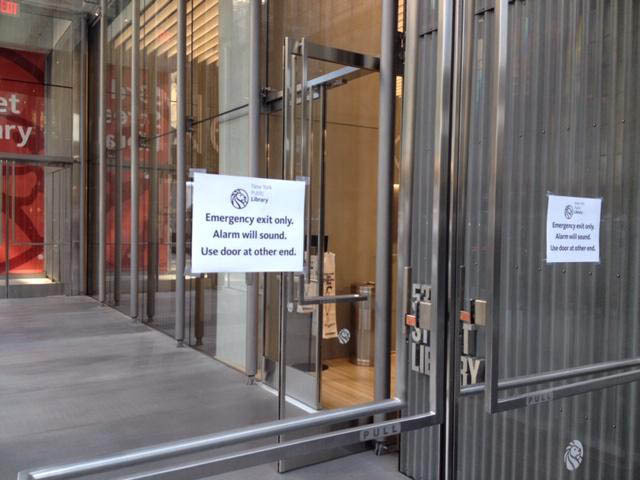 But What Does New York Get?” - Kimmelman balanced his essay's seeming enthusiasm for Amazon's arrival in this respect slightly: He contrapuntally glowered about the Amazon giant’s plunking down here and the “insularity” and libertarianism of the tech industry in general. Do we really want “gifts” or “give-backs,” from giant mega-monopolies, so labeled in intentionally confusing narratives as we allow such entities to take over sections of the city supplanting government, and doing so in the name of `private/public partnerships'? We’ve seen this before. For instance, when the MTA, sending its head Joe Lhota to a ribbon cutting was promoting a “$76 million Barclays Center subway station” as a `gift' from Atlantic Yards developer Forest City Ratner. The notion gets pushed with the too-good-to-be-true con that “not a cent of it came from taxpayers’ pockets,” despite the fact that, all told, Forest City Ratner was walking away with overall project subsidies totaling $2 - $3 billion. Last week there was a NYC Public Advocate Candidates Forum in Brooklyn Heights. Sixteen self-proclaimed candidates for that city-wide elected office took part in panel discussion (and a few additional candidates who have thrown their hat into the ring weren't there). Amazon was naturally discussed. It was discomfiting to hear how many of those candidates thought that Amazon's arrival in Queens should simply be accepted as a given and that all that needed to be discussed was what Amazon would "give back," as if this was the way that government should work. The candidates are too numerous to inventory their Amazon positions here, right now. Furthermore, given the difficulty of “looking a gift horse in the mouth,” such private sector “gifts” are harder to criticize than what is provided by elected officials. That sadly is the case even when such “gifts” reflect an agenda on the part of the wealthy donors and an effort to shape the world as they would like to see it shaped. Take, for instance, this undemocratic result: how a school district can wind up with less funds for what the public wants funded when the (Bill and Melinda) Gates Foundation pays the school district on condition that it divert its available funds away from other expenditures that were the district's priorities; instead the funds go to a questionable pet project the foundation is promoting. Or very similarly, consider the funds that get advanced to pay for schools to be converted into private charters? Under those circumstances, do we want our public schools furnished as gifts from the private sector? Isn't it preferable to have public services provided by our own elected governments whom we can ultimately hold to account? (If we don't want our schools taken over by the private sector, what about our libraries?) But what is, in fact, happening in this day and age is that we are more and more, in all sorts of ways, turning our governance over to private corporations like Amazon. David Callahan whose new book is “The Givers: Wealth, Power and Philanthropy in a New Gilded Age,” writes how, as government is starved and retreats while the influence of the superwealthy increases, the new `philanthropies’ have become “a much stronger power center,” that “in some areas, is set to surpass government in its ability to shape society’s agenda.” Callahan has also previously pointed out that this “growing say over central areas of civic life like education and public parks . . is often wielded against a backdrop of secrecy.” As that shift in influence occurs, it is often with the superwealthy like Bezos, the world’s richest man, contributing to that starvation of government as, for example, he sidesteps payment of sales tax. Let’s be clear, despite some similarities in the eyewash aspects of it, Amazon’s dealings with respect to coming to Long Island City were not an example of such `philanthropic’ equations: What transpired, with respect to Queens was supposedly in `negotiations,’ supposedly adversarial. However, with it being mostly all in secret, it was apparently mostly about the government’s surrendering of governance decisions and the norms of government supremacy to give Amazon things it was demanding, things there is little reason to believe Amazon deserved or should have been given. It can be readily argued that Amazon has never been about playing fair, that its extraordinary growth (while paying shareholders little) has been about benefitting from a tilted playing field, not paying sales taxes, taking advantage of its monopoly status to squelch competition. It's resulted in a huge amount of value others have created in the economy being reshuffled to wind up in the Amazon/Jeff Bezos coffers. It is not in Amazon’s nature to “take less.” When Seattle passed a small tax on businesses making more than $20 million in gross revenue in order to address its homeless crisis (greatly acerbated by skyrocketing rents), Jeff Bezos and his Amazon, Seattle’s biggest employer and the second biggest company in the United States, used their political heft to crush the tax, getting it repealed. That was the absurdity even though Jeff Bezos as the world’s richest man has been calculated to be making “roughly $191,000 per minute” while the median Amazon employee’s salary is just $28,000 and many of Amazon’s workers, impoverished by the low wages the monopoly pays, collect food stamps. In other words, unconstrained by anything that was "bargained for," Amazon is simply following through on what it likely wanted to do anyway, have a major presence, and therefore influence, in the nation’s political capital and in its financial capital, the nation’s two major power centers. Ask yourself why you think Jeff Bezos bought the Washington Post; it's for the very same reason. This division putting some of the Amazon offices in a separate location near the Pentagon will probably also help Amazon manage the flow of those of its workers needing security clearances to do the military work Amazon does for the Pentagon and CIA. . . this whole tournament has been a sham. There is no HQ2. Instead, Amazon is expected to announce a fairly routine expansion, adding new satellites in Queens and in Northern Virginia. The countless hours spent courting Amazon were undoubtedly valuable for Amazon: the company gained free media coverage and untold amounts of economic data from each bidding city. But it has been a terrible waste for those cities and states whose public servants labored to win a prize that would never materialize. Even for the biggest Amazon boosters, such casual dishonesty should be cause for consternation. It’s like getting a marriage offer along with a confession of infidelity. If Amazon indeed locates a substantial part of its business in New York, serfdom is the style of “partnership” the city should expect. Despite the familiar promises, Amazon is not a good partner. Not for the cities it occupies, not for the merchants who depend on it, not for the workers it employs. The company does not seek partnership; it seeks control. 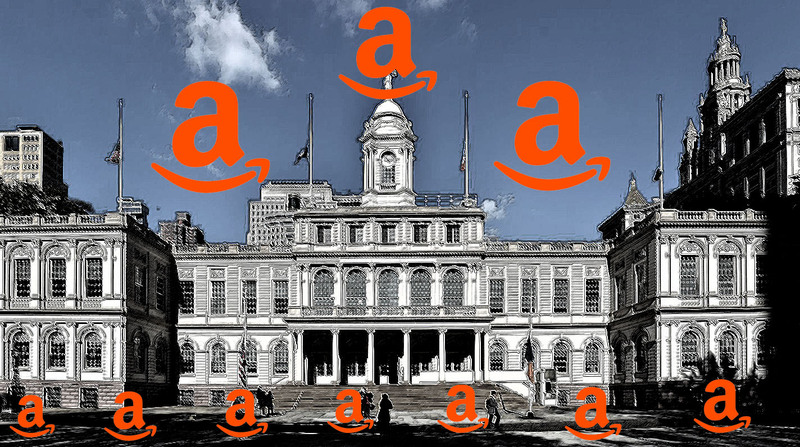 See: Opinion- New York Should Say No to Amazon- A city that thrives on the energy of its neighborhood merchants should not offer incentives and giveaways to an internet giant known for squashing small businesses, November 9, 2018. One of the fundamental government powers that will be surrendered in the Amazon deal is that Amazon will not pay real estate taxes. Instead, the Amazon section of the city, carved out from the rest of the city will make payments in lieu of taxes pursuant to a “PILOT” agreement. All the reasons this will be attractive to Amazon are reasons it will not be good for the public, that includes things like suspicions about the amounts paid, inability to challenge and rethink them going forward, and, like the increasing patchwork of other areas affected by such PILOTs (Brooklyn Bridge Park, parts of Atlantic yards/”Pacific Park”), being cut off from the vicissitudes of the city and communal obligations of all New Yorkers to address them. Another of the fundamentals of local governance surrendered to Amazon will be zoning and land use controls. Density and how the land will be used will not be subject to the normal way such controls are supposed to be thought through and established with the normal City Council and community reviews. Just one way this is showing up is that Jeff Bezos has been promised his Amazon site will come equipped with a helicopter landing pad. Helicopter landing sites are a serious land use issue. Helicopters are dangerous, which is why, after a 1977 accident, the helicopter pad atop the MetLife building, formerly the PanAm Building is no longer active. Helicopters are also extremely noisy, not to mention, as anyone who has been around a landing site knows, their fuel has a pronounced unhealthy stink to it. The surrendering of these governmental powers results from the involvement of the state’s Empire State Development Corporation (ESDC or ESD), a quasi-governmental, unaccountable public benefit corporation that is notorious for its being subject to “regulatory capture,” which is to say that rather than being careful to ensure that public benefits are achieved, the agency answers to its private developer clients (in the case it will be Amazon and its agent developers) to give them what they want. Another power that ESDC has is the power of eminent domain, the power to condemn and take property from other private landowners for “public use.” In recent years, as with Atlantic Yards, that “public use” has meant giving land or property over to another more favored private developer. In the case of Atlantic Yards it was used to acquire land to build a private arena (infamously named "Barclays"). That use of eminent domain may not have been actually necessary given that Forest City already owned other adjacent property. Eminent domain was also used to a very large extent push out the competition of other developers building in the Atlantic Yards vicinity. . . Oh, wait– pushing out the competition?– Exercising of that superpower of government sounds like a perfect match for our Amazonian outfit.
. . . Before government steps in to pick the winner, people should stop and think. Such shoving aside of other economic life for the promises that a property owner/developer with the political heft theoretical offers when asking that these powers exercised on its behalf often doesn’t go very well at all. When the Supreme Court’s ruling in the Kelo v. City of New London case validated such shenanigans in New London, Connecticut, a huge swath of land was cleared to be turned over to Pfizer. The land, all other properties removed from it, wound up as an abandoned, empty grassy field. Forest City Ratner, taking over with eminent domain the 22 acres that is formally considered Atlantic Yards project (distractingly renamed "Pacific Park" out of embarrassment and to side-step bad press), has probably slowed the development in the area where it supplanted its competitors. Forest City Ratner (its heirs and assigns including the Chinese government) has kept few of the promises Forest City Ratner made in connection with everything it was given by government officials on a preferential, essentially no-bid basis. That mega-project, once projected to be complete in 2013, is years, perhaps decades away from completion. At one point the revised estimate of the then head of ESDC was that it could take perhaps 40 years in all to complete. Meanwhile the developer has destroyed affordable housing it will never replace. Because ESDC’s powers are so phenomenal, its procedures require that it only come in to exercise its powers in an area if there is a letter from the locality (in the case New York City) inviting it in to supersede local laws. In this case that letter is probably being delivered by Mayor de Blasio. However, perhaps to give de Blasio cover, there was another letter signed by a slew of local electeds, city council members, saying that they wanted Amazon to come to New York. These city council members are now, en mass, disavowing what they previously signed. Time will tell whether their display of this announced change of heart will evolve into effective action. Whether or not ESDC actually exercises its condemnation powers in any respect, the preferences and subsidies that are to be given Amazon will have an exiling effect pushing out others. Maybe the Amazon plan will ultimately provide “600-seat public school, affordable space for manufacturers, arts groups and early-stage tech companies,” but at a Department of Education building at 44-36 Vernon Boulevard, approximately 1,000 staff will be kicked out of the area. The cost for them to pull up stakes and rebuild is probably not being calculated. Further, with the redirection of two sites intended for residential development to Amazon, those sites will not produce the approximately 1,500 units of affordable housing that was in the works. So that lost housing must be considered as another cost. All of the preferences and subsidies for Amazon will serve to push out, displace and deprive of opportunity other economic activity that would be looking to have a place in Long Island City’s relatively hot and active real estate market. There is a flip side too: Those pushed-out competitor businesses will also be unhappily affected by diminished city services with Amazon-occupied properties subtracted from the tax base. When the government is incurring so many costs on behalf of Amazon, when it is putting so many eggs in the Amazon basket, it can affect long term alignments. . . . When I was at the state finance agencies we bonded out the state’s settlement income that resulted from successfully suing the tobacco companies, when New York State joined as plaintiff with other states around the union represented by their attorneys general. What this meant was that the annual amounts that the tobacco companies had agreed to pay New York State as damages for dissemination of false and misleading information about cigarettes plus the consequent harm to the health of citizens and increased medical costs to the state were collected up front by the state through our issuance of billions of dollars in bonds, which were to be paid off over time from the payments the tobacco companies were obligated to make under the settlement. Given the bonds were supporting the tobacco companies’ payments, I remember being personally worried that the state, wanting its bonds not to default, might acquire a vested interest in the continued financial health of the creditor tobacco companies through the issuance of the bonds. I worried that the state might therefore want company cigarette sales to do well so the companies would always be able to make the payments unhampered by declining consumption. But, for the very reason that the states had sued the tobacco companies, the state still needed to pursue health, safety and welfare goals; it still needed to continue to exercise its police powers to cut down on smoking and run tobacco consumption prevention programs. In the case of our New York State bonds, that likely conflict of interest was forestalled through the purchase of bond insurance: If defaulting tobacco companies didn’t make their payments the bond insurer would have been left holding the bag after paying off the bond holders; it would be the state's problem. Quite surely, one reason Amazon is moving here to the financial capital is to more closely align itself with the powers here. But New York, as a policy matter, has to think about whether it will want to endorse Amazon’s monopoly practices. It will also need to sort through its position on Amazon’s involvement and roots in the military, Amazon’s relationship with the CIA and the general ongoing implications respecting surveillance as the tech sector of the economy evolves. It is worth remembering that once upon a time New York, a financial capital in the 1800s, was a northern city, but because of New York banks investing the cotton trade and plantations long after the legality of the slave trade itself was ended in the United States in 1807, New Yorkers were complicit in the perpetuation of slavery. It’s easier to allege what you are that you are acting in a morally neutral way, that what you are doing is “just business,” if you don’t have sunk costs invested someone else's enterprise. If your investment means that you have essentially become their partner, you will be quite reluctant to see their business succumb. Does Alliance Between Government and Monopoly Produce Fascism? Law professor Tim Wu, who ran for the Lieutenant Governor slot on the ticket with Zephyr Teachout when she was running for governor of New York State has his own anti-monopoly ideas. He warns of a link between monopoly control and the rise of fascism and totalitarianism. In the 1930s it contributed to the rise of fascism. Alarmingly, we are experimenting again with a monopolized economy. November 10, 2018. Explaining how control by monopolies contributed to the rise of fascism in the 1930s, particularly in Nazi Germany, Wu explains that “extreme economic concentration” creates economic conditions ripe for dictatorships when “democratic accountability” is avoided as loyal alliances are formed between those in power and large enterprises that then feel themselves to be above the law. He points out how there is “there is a direct link between” such concentration “and the distortion of democratic process” given the escalating imbalance of power as huge corporations pursue their political goals. We have forgotten that antitrust law had more than an economic goal, that it was meant fundamentally as a kind of constitutional safeguard, a check against the political dangers of unaccountable private power. It is probably worthwhile to remember that one of the sometimes used definitions of "fascism" is an alignment that merges government and corporate power. Will Alignment With Government Allow Amazon To Write The Rules of The Market Place? Earlier this year Stacy Mitchell, wrote a cover story for The Nation titled “Amazon Doesn’t Just Want to Dominate the Market—It Wants to Become the Market.– The company is a radically new kind of monopoly with ambitions that dwarf those of earlier empires.” February 15, 2018. Amazon is so dominant in so many areas. It’s now capturing one out of every two dollars that Americans spend online. . . it controls the underlying infrastructure for a lot of the internet—you know, over 40 percent of the world’s cloud computing capacity. It’s increasingly moving into shipping and package delivery. It’s taking on UPS and the Postal Service. It has the largest market share in home voice systems, through Alexa. And on and on it goes. Remembering how Amazon is a giant information vacuum, sucking up tons of detailed information about its consumers and about the retailers selling to them through Amazon, allows you to understand the worries some have about how Amazon, with its "auction" ploy, managed to induce almost all the major cities in the country, all the economic centers, to collect, organize and supply to it vast amounts of confidential data about local economic activity. Then think about Amazon's disposition to use information that only it is privy to tilt the playing field in its direction. Now realize what an advantage the information Amazon now has in deploying its resources in terms of real estate investment and economic planning. the power over such crucial questions as which books and ideas get published and promoted, who may ply a trade and on what terms, and whether given communities will succeed or fail. Her article points out that Amazon having aggressively sold books and other items below cost shutting down bookstores “in droves,” today “nearly half of all books, both print and digital, are sold by Amazon.” Mitchell does not take next step of noting that, for a company with such significant CIA and military connections, that’s so dedicated to, and expert at, data collection and consumer profiling, the implications are enormous. There is a lot to be thought about in this regard, including how Amazon chose to start its business with books, drove the industry and public toward digital books, and now also has extraordinary control other content, particularly the digitally supplied video and film, that is such an important part of the overall milieu for thought and discourse. On Democracy now Mitchell also said “our calculations suggest that we’re losing about two retail jobs for every one job created in an Amazon warehouse.” The hemorrhaging of these jobs may be accompanied by a quashing of future innovation throughout the United States. In her Nation article, Mitchell cites studies starting with work based on observations of paired cities by C. Wright Mills and economist Melville J. Ulmer that cities with locally owned businesses and local economic power are more economically robust and civically healthy, with a greater variety of jobs and residents more involved in community affairs, more investment in public infrastructure and better at problem solving. But, probably more important. . . Amazon’s total control and top-down robotic streamlining of everything it does, might be thought of as benefitting the public with a cost-saving efficiency that justifies all its aggressive usurpations, but near the end of her Nation article Mitchell reminds us that history tell us that “a surge of innovation and start-up activity” followed in the wake of the Federal antitrust actions against, AT&T, IBM, and Microsoft. That's exactly the same point that Tim Wu made exploring this subject in “The Master Switch,” which also included his exploration of the creativity unleashed in the film industry when its vertical integration, and the related censorship affecting it, was broken up. Thereafter we saw the flourishing of “the new Hollywood era” (late 1960s to early 1980s) with more idiosyncratic, experimental films made with greater license that were more cerebral, edgier, more defiant, moodier, and more erotically explicit. Jane Jacobs thought along similar lines when she explored where economic vitality and innovation flows from. In her first, groundbreaking book, “The Death and Life of Great American Cities” (1961), Jane Jacobs celebrated the dynamism, vitality and benefits of diversity in American cities. She was rejecting the cookie cutter, centrally-produced, sterile monotony, albeit efficiency, of programs like Robert Moses’ exercises in “Urban Renewal.” Jacobs, in her later books extended these concepts exploring granular examples of what brings vitality, dynamism, innovation and sustainability to national and city economies. It’s too far afield to go deeply into all of Jacobs' ideas on the subject, but suffice it to say that, in Jacobs’ view, its not the efficiency of centralized planning that generates economic life and vitality; it’s quite the opposite— It’s the very messiness of a lack of centralized planning, and it’s a diverse environment where innovations are generated bottom-up, the result of serendipitous collisions of variety. To add one more consideration: No doubt the multiplication of conscious observing human minds is certainly another essential part of the equation. . . That’s whatever stock you place in the future of A.I. ("Artificial Intelligence"). To Jacobs the economic monoculture of a car manufacturing city like Detroit, albeit however efficient as a passing phase, was a recipe for future economic stagnation. Does, such a consolidating, concentrated top down management approach help an economy and civilization advance long term? Did it help the Soviets catch up and advance into the modern era? The Amazon created science fiction series "The Man in the High Castle," which speculatively posits a future that never happened, envisions that if Germany had won World War II to take over much of the United States, German efficiency would have led in short order to a range of technological advances . . .Humm: Maybe-- Or is Jane Jacobs right: Does such the kind of monoculture and lack of variety such as we are getting with Amazon's relentless march of takeovers lead, in the longer term, to stagnation? Why do we let Amazon get away with such bad behavior, especially if it is, in so many ways, so bad for our economic, civic and political health? In an eloquent sermon at the First Unitarian Universalist Congregation of Brooklyn, Reverend Ana Levy-Lyons, responding to the news of Amazon's arrival and dealing with a number of these issues, suggests that we are trapped by consumerism and the pay-off of what seem to be cheap purchases. The way out is not simple. Economist John Maynard Keynes described a conundrum, the paradox of thrift, a sort of "prisoner's dilemma" proposition, that if everyone responded to a slow and uncertain economy by acting in their individual self interest to increase their rate of savings to be safe, then everybody would be hurt more as the economy was slowed down even further and made more uncertain as a result. The Keynesian solution was governmental pump-priming, a sort of resort to collective action. . .
. . . When the question is what to do about Amazon, we may not realize it, but the solution is somewhat similar. We might not quickly realize the similarity because, instead of thinking about prompting more spending overall, we are thinking about how to refrain from spending that goes to the big giant. But the answer is again to view the situation in terms of what is best for everyone collectively, and, as Reverend Levy-Lyons suggests in her sermon, to act collectively to deal with it. This may involve uniting into groups as Reverend Levy-Lyons gives the example of a collective of antiquarian book sellers that acted together in concert to protect one of their group when Amazon was victimizing them. . .
More likely, what is going to be more effective in terms of organizing collective action is for government to do its job in confronting Amazon as the monopoly it is and reining it in, in the ways it needs to be restrained. That is why it is so unfortunate to see government instead aligning with Amazon and turning the powers of government over to Amazon. Without collective action, separated from the rest of our herd, Amazon hunts us down like gazelles: Reverend Lev-Lyons began her sermon with a vivid description of how Amazon making “no effort to hide their tactics” during `negotiations' with companies about prices would stalk them “the way a cheetah would pursue a sickly gazelle”: In fact, she pointed out that “the Gazelle Project” is “what Amazon called a new initiative to work out contracts with small publishers,” and that involved simply making those companies it was `negotiating' with disappear from its internet universe when it wanted to show them they had no negotiating power. Disappearing from that universe now means companies can't survive. We previously mentioned in passing, "The Man in the High Castle." That's just one example of a made for internet streaming that is available to be watched free by Amazon Prime members. Another that you'll hear a lot about is "The Marvelous Mrs. Maisel," that swept up a lot of Emmy Awards while also getting a couple of Golden Globes awards. You can watch these series for free if you are an Amazon Prime member, which means that you have already pre-paid for Amazon accelerated shipping as an inducement to do all your shopping there. One thing that has so far gone unmentioned is that the Amazon Long Island City waterfront site would be just blocks, only a few minutes away, from Silvercup Studios, that's one of the city's very important film studios where, for example, HBO once filmed "The Sopranos." Specifically, Amazon's offices would be just a fifteen minute walk to the existing studio facilities and perhaps just half that to the planned Silvercup Studios West expansion planned for the waterfront just below the 59th Street Queensborough Bridge. With Amazon almost singlehandedly replacing all the video stores of the days of yore, being the only source for many films once obtainable there, and now expensively investing in its own video shows, films and content, this should not go unnoticed. Amazon will have a headquarters in the political capital of the United States and here in the financial capital as well: Maybe Amazon will never need to open another headquarters (HQ4?) in Hollywood, as the entertainment capital of the country. Norman Order, the city’s foremost expert on the Atlantic Yard mega-project and its dealings with ESDC and local elected officials, wrote an analysis based on that history cautioning how little we can be sure of what to expect based on what we know or is promised now: “Atlantic Yards within a few years changed significantly.” See: For Amazon HQ2 deal, Atlantic Yards serves as a warning, November 15, 2018 By Norman Oder. What might be coming? Be open to thinking big-- Previous to the announcement of Amazon’s interest, what is slated to become the Amazon site, land along the 1000 foot long artificially created shoreline inlet known as Anabel basin, was being covered more innocuously as another planned rezoning and real estate development. . That might involve the tallest building outside of Manhattan, a 700 foot tower. Given all of the above, the question of Amazon huge subsidies and just how much they are should be an absurd afterthought. The New York Times editorialized that Amazon shouldn’t be getting the subsidies calculating those subsidies at $1.5 billion. See: Opinion-New York’s Amazon Deal Is a Bad Bargain- The city has what the company wants, talent. Why pay them $1.5 billion to come? By The Editorial Board, November 14, 2018. Another Times article says $1.7 billion. Good Jobs First calculates the subsidies of both the New York and Virginia deals as exceeding $4.6 billion and says that separately, just New York State’s award under the Excelsior program is projected at $1.525 to $1.7 billion. Greg Leroy executive director of Good Jobs First discussed the subsidies along with others on Democracy Now on November 14. 2018 and at 7:30 AM was also on the air on WBAI’s Morning Show that same morning. On top of this there will probably be other subsidies piled, like perhaps Federal EB 5 program for financing. One day perhaps we'll see. why the New York incentive package was worth twice as much per employee compared with the one in Virginia, where taxes are lower, Cuomo said he didn’t know how it was calculated. “There’s all sorts of ways to work these numbers,” he said. That’s for sure. Ultimately, neither he nor de Blasio will be around to do that math, while future governors will have ESD at his or her disposal. When, in my tender youth, I heard about the horrors of the trap of "the company store," its seemed almost like an impossible fiction from the past. Now-a-days, it is remarkable what we seem to take pretty much in stride coming from Amazon . . . even as, like things once were in those days or yore, Amazon is so all enveloping that it is everything. Like in those days, it even seems to have become the government. Meanwhile, "The Company Store"? We seem to know that now as a clever marketing name that was adopted for a retail outlet . . . .
. . . Not surprisingly, they too sell through Amazon. It’s a not so pretty please with a cherry on top . . .
. . . A $1,500 ice cream sundae– And it’s plain vanilla! OK, so it’s not supposed to be just “plain” vanilla; it’s supposed to be Madagascar vanilla. Where do you get this expensive sundae? 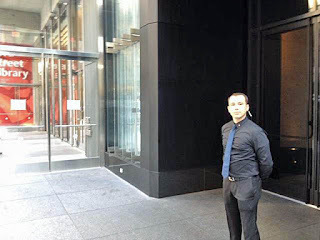 At the Baccarat Hotel, which sits where the beloved central destination Donnell Library once stood in Manhattan, across from the Museum of Modern Art. And the priorities at the time were very evidently those things that catered to the wealthy: The luxury hotel, the luxury condominium building, the luxury restaurant replacing the Donnell Library all opened more than year before the “replacement” library opened, that was a replacement the NYPL was too embarrassed to call Donnell as promised. 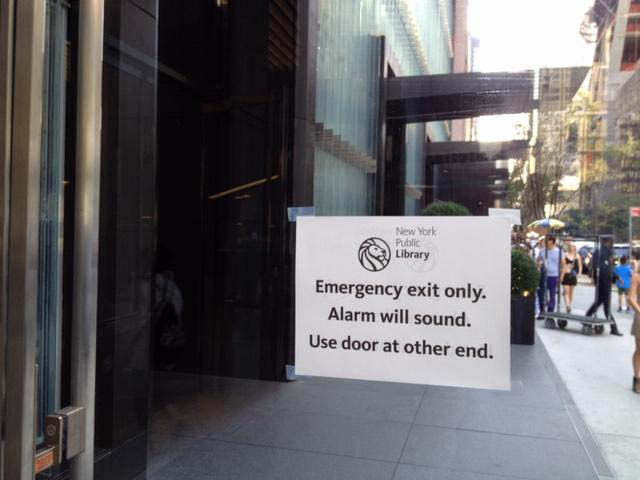 That replacement library opened almost nine years after the library’s sale. If you want to see images, of the old Donnell vs. the “replacement” see Citizens Defending Libraries (I am a co-founder): Images and Links- The 53rd Street "replacement " for the Donnell Library to be opened Monday and What We Lost. The luxury hotel in the building replacing the library is the Baccarat Hotel. In the November Noticing New York article about these topsy-turvy priorities we wrote about the expensive dining to be had the hotel’s Grand Salon whilst sitting on “coyote” pelt upholstered chairs. 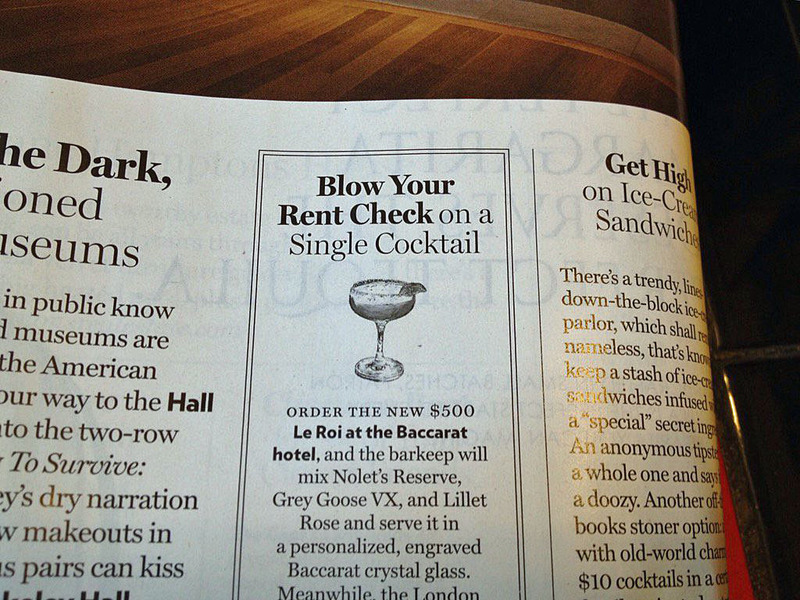 The inadequate replacement for Donnell opened in June of 2016. . .
. . . That June is just when New York Magazine was advising readers they could blow their rent checks “on a single cocktail” by ordering a the new $500 Le Roi cocktail at the Baccarat hotel. See also the $450 Sidecar Royal served in the Hotel’s Les Boissons bar (“The opulent New York City property is sticking to its roots with this new ultra-luxe libation”– what, it’s roots as a library?). Previously, how very little the Library was sold for could be measured against what apartments in the luxury tower were selling for: The $60 million asking price for the penthouse was almost three times what the NYPL netted to sell the five-story, recently renovated, 97,000 square foot Donnell Library. Other apartments were selling for close to exactly what the NYPL netted on its sale. 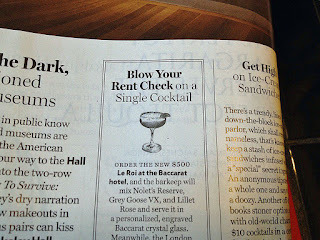 With “Le Roi” cocktails going for $500, it seems that the perhaps $23 million netted by the NYPL could be measured by multiples of the cocktail price. Well, to keep up to date with extravagance, a new article in USA Today now advises us that you can get a $1,500 vanilla sundae at the hotel too! See: USA Today: Gold popcorn and a $2,000 frittata: Five of the most expensive meals money can buy, by Rasha Ali, December 11, 2018. The article provides us with a list of the most expensive (though simple) foods the wealthiest of us can foolishly spend their money on: a $5,000 burger, a $2,700 pizza pie, $2,500 for popcorn (a 6.5 gallon tin), and a $2,000 frittata. Yes, from USA Today, that's a picture of a $1,500 ice cream sundae you can get where one upon a time there was a grand public library. It's literally just vanilla bean ice cream, dressed up in fancy accessories. The ice cream is served at the Baccarat Hotel New York and is made with vanilla imported from Madagascar (fancy). 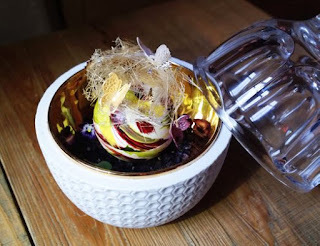 It's also served with black truffle crumble with dark chocolate, hibiscus champagne sauce and donned in an edible gold leaf, then served in a $1,200 crystal bear. The ice cream alone costs $300, but if you want the whole ensemble, it'll cost you $1,500. The last visit to the 53rd Street Library that “replaced” Donnell this is what we noticed: The architect had designed the front entrance with two separate doors, one east, one west, for library patrons to enter before they descended to the library’s mostly underground space– One of those doors, the west one, was closed off so that library patrons didn’t come too close to rubbing shoulders with those well heeled chums and chumettes visiting the luxury portions of the building for $1,500 ice cream sundaes. 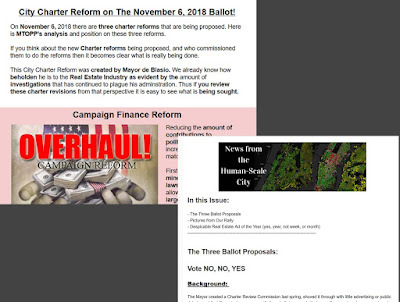 The adviceon how to vote on three proposal to change the NYC Charter sent out by two activist coalitions (above) is pretty similar and largely negative about the proposals. On #3? : Think about it, only MAYBE? YES. 1. On “Campaign Finance Reform- Reducing the amount of contributions to politician’s campaigns and increasing the amount of matching funds.” VOTE NO. 2. On “Creation of New Community Engagement Agency.” VOTE NO. We are shortcutting this process and not doing all our own thinking on it. Instead, having reviewed them, we present here the consonant recommendations, with some very validly expressed reasoning of both MTOPP (The Movement To Protect The People) and The New Yorkers For A Human-Scale City Alliance, two activist group coalitions vigorously fighting for more responsible, less destructive development (with less displacement) that will better reflect the wishes of New Yorkers. First off, as you can glean from the title of this post, to call something a “reform” doesn’t mean that it actually is validly and unquestionably a “reform”; some changes labeled “reforms” actually make things worse for most of use while shifting more power, benefit and control to the powerful (think Trump’s “Tax Code Reform”). Next, the way that revisions to the City Charter get proposed and put before the voters makes it likely that proposed changes will benefit those already powerful and controlling the process and not those wanting to challenge power. This will likely hold as the general reality of things unless and until strong, broad based populist efforts seize the initiative and coordinate for proposals that effect true reform. That is not exactly true of the mostly below-the-radar way that the current proposals were cooked and served up. 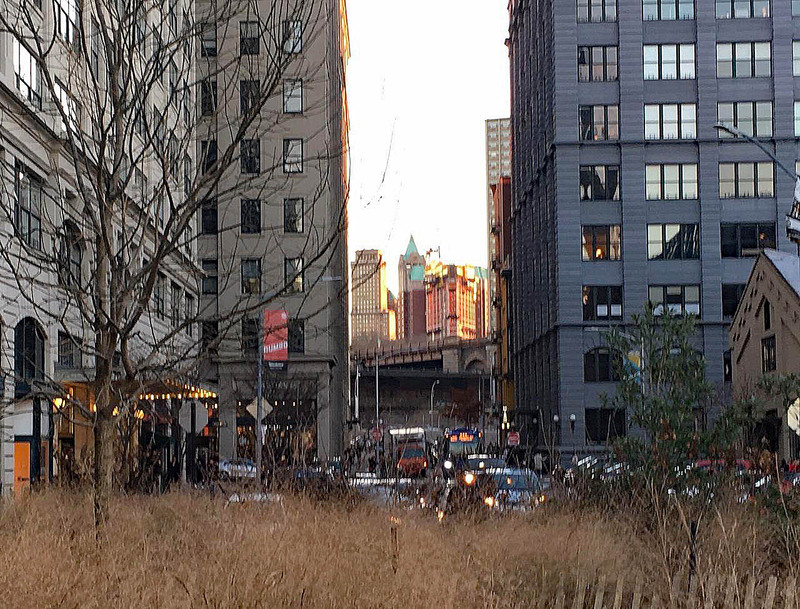 Here is some background on what happened as described by The New Yorkers For A Human-Scale City Alliance. The Mayor created a Charter Review Commission last spring, shoved it through with little advertising or public debate, and that Commission came up with three ballot proposals that you will encounter when you go to vote next week. Most voters had no idea it was happening. We testified at one of their hearings about campaign finance and community board reform. The City Council, not to be outdone, created its own Charter Review Commission, which, I am told, is preparing another round of hearings this winter. We testified at the first round of their hearings and will be testifying again this winter and spring. Remember that every ballot proposal is worded by the people who want to see it enacted and is thus worded with the hope of enticing people to vote for it. One thing that is highly discouraging is that, as City and State observes in its reporting: “The measures from de Blasio’s commission . . have drawn overwhelming approval from the city’s Democratic lawmakers.” Proposals that please "Big Real Estate and the Mayor"? This is another example of how the Democratic machine in New York City continues to work against the most fundamental interests of the public while nominally working for the public dressing up, without significant challenge from the press, in fauxmanteau progressivism. That’s why, to get some genuine reforms, this city needs to institute instant run-off voting and start growing third party generated alternatives for the voters to vote for. Below are the proposals worded as you will see them on Tuesday’s ballot followed, in each case respectively by the analysis and recommendations of MTOPP and The New Yorkers For A Human-Scale City Alliance. Interjected in brackets is some of my own Noticing New York thinking about the composition of community boards. In addition, the proposal would make public matching funds available earlier in the election year to participating candidates who can demonstrate need for the funds. It would also ease a requirement that candidates for Mayor, Comptroller, or Public Advocate must meet to qualify for matching funds. The amendments would apply to participating candidates who choose to have the amendments apply to their campaigns beginning with the 2021 primary election, and would then apply to all candidates beginning in 2022. Campaign Finance Reform- Reducing the amount of contributions to politician’s campaigns and increasing the amount of matching funds. First you have to keep in mind that there are a lot of laws on the books that allow Politicians to get large sums of money from various sources. For example, campaigning and collecting funds when you are not facing an opponent! This allows existing elected officials to create large war chests that they can use later, if a challenger does come a few years down the line. Thus the reducing of the contributions will only benefit the large, well machined candidates who have the real estate industry working behind them exercising all of those other loopholes. Whereas the small candidates who truly must rely upon small contributions will be further hurt. For example, in the election campaign against Councilwoman Laurie Cumbo, she had three campaigns working for her. Her own, the Mayor’s and the Hotel Industry!!! So a reduction in contributions to her campaign would not have made much of a difference, but with Ede, who was running against her, it would have been large since she had only one campaign! MTOPP says no. If real voting reform is wanted (and it is not) then all of these loopholes need to be eliminated not just campaign contributions. Proposal 1: Vote No. Lowers the maximum campaign contribution in the City's Campaign Finance Law (not the state law) from $5,000 to $2,000. Why vote no? Think about it. Can you afford to give $2,000 to a politician? This is a fake fix to the campaign finance system and all the politicians know it. It won't stop the dependence of politicians on the wealthy or on big real estate, nor does it even address the issue we have been raising for a year about loopholes big as trucks that allow big real estate to get around the rules that are part of this law. This isn't a even an improvement - it's a pretend fix, an actual insult to good government groups and to the public. Don't let any politician get away with the claim that they "improved" the system with this one. It would be a shameful lie on their part. Vote NO. Creation of New Community Engagement Agency. Now isn’t the community board suppose to be the place for community engagement? And why would you need a completely new government agency just to provide the community boards with planners? The answer is simple. If you empowered community boards to hire their own planners, then the planners would be beholden to the community board and have their best interest at heart. However, if you allow another agency to do the hiring then those being hired would be beholden to that agency’s directives. The Department of City Planning has such a bad reputation in communities all over the city that they are no longer trusted and in some community boards are told to get the hell out! Now this new agency who’s leaders will be hired by the Mayor, will hire and then lend City Planners to community boards. 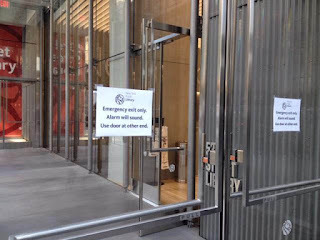 The rational is that the only reason community boards are saying no to all of these rezonings is because of ignorance. If they just understood all the benefits that would be gained from all the developments being proposed Community Boards would be more willing to agree to them. For example, when the City Planning Commission was reviewing the Brooklyn Botanic Garden rezoning to increase the heights on land that was downzone to protect the garden, the Department of City Planning blamed the no vote that Community Board 9 gave because CB9 didn’t have a planner! But we we did. We had Richard Birack, Borough President Eric Adams's planner, at every meeting, “giving” his expert opinion, that sometimes amounted to pure lies and half truths. But the proof is in the pudding, it doesn’t take a rocket scientist to understand the devastating effects of rezoning, not when there are so many examples out in the world, including how the Department of City Planning will simply ignore all suggestions from the community despite all of those so called “community engagement” sessions!!! Proposal 2: Vote No. Creates a Civic Engagement Commission dominated by Mayoral Appointees who then get to mess around with so-called participatory budgeting and community boards land-use work. Why vote no? This is a blatant attempt to create even more power for a despotic Mayor who already has way too much power in our Charter. It also makes some of us laugh. Our Mayor won't even take petitions or respond to petitions that neighborhood groups send him, and he wants a Civic Engagement Commission? Worse, those who came up with this idea seem to think civic engagement just means controlling community boards on land use and pretending to give us a say in budgeting. Ugh. This is an Orwellian proposal. Vote no. If Question 2, “Civic Engagement Commission,” is approved, require the proposed Civic Engagement Commission to provide resources, assistance, and training related to land use and other matters to community boards. As can be seen from the analysis of MTOPP and The Human Scale New York coalition below, there are huge problems with the current composition of the city's local community boards, including that they are often rife with conflicts of interest and accountable on very short leashes to the Borough Presidents. We have seen the composition of such boards punishingly changed by Borough Presidents when they represented the community in their votes. We have also seen the calculated re-composition of the boards and their committees in advance to prepare for and ensure the vote results the real estate industry wants in instances such as the proposed sale of public libraries for real estate deals. But does the institution of term limits ensure any improvement with respect to what needs to be fixed? : Only sometimes in some particular instances, and other times it can have the opposite result. The question is how to make community boards more accountable to and representative of the community. More transparency with stricter conflict of interest controls would help a lot. Should community board members be elected directly by the public? : The problems with that, as with electing school board members and judges, is that it is too much for the average voter to catch up with by the time they get into the voting booth. That opens the door for other inside powers to have too much influence. 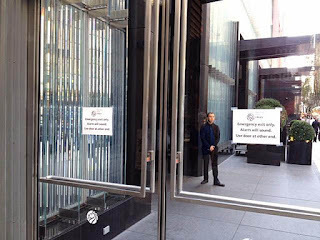 What community boards and other New York City boards of influence (the Landmarks Commission, City Planning Commission, boards of the three city public library systems) might benefit from is diffusing the appointments to those boards among more elected officials who the public is likely to be able to identify and hold accountable when their interests don't get represented. One of the benefits of all the myriad appointments to boards and commissions now made by the New York City mayor is that the public knows who the mayor is and, as such, can more easily hold him or her accountable. What the mayor does is more likely to be written about and covered by the press. But one individual having all the power involves no checks and balances and sets up just one easy target for the powerful influencers like the real estate industry. Others who could be making appointments include, as the case may be: The New York Public Advocate (giving that office more of the power it should have), The City (and perhaps sometimes State) Comptroller, local City Councilmen, perhaps in some cases the City Council as a body, Borough Presidents (offices that also currently have scant power). If nothing else, more diffused power means that when moneyed interests want to put the fix in they have more elected officials to corral and buy off and it is harder for them to operate for long stretches in secret. It is also likely to provoke a few more real open debates on a few more things before votes rather than discussions before votes being as scripted as they almost always are now. There are two points of view: The Upper White Middle Class Community Boards and the Community of Color Community Boards. As has been the case since the inception of Community Boards and their empowerment in 1974, community boards have fared a lot better in white upper middle class neighborhoods than in communities of color. Community Board members in white upper class community boards are knowledgeable, know their stuff, have been around the block and have been a thorn in the real estate industry side, because of their unwillingness to let anything slide by them. These board members are very strong and Borough Presidents have been unwilling to let them go because of the political consequences. However, if term limits are introduced, then the Borough Presidents can not be blamed and then they will get to put who they want in, who will be beholden to their goals and not necessarily the goals of the community. Thus term limits in White middle class communities may weaken these boards! What about communities of color, who’s boards are already weakened? There have been countless complaints against these community boards and their members. Serious violations of the law are done openly and no one does anything about it. For the most part the board behaves like a private club with a few people running the whole thing for years, at the expense of the rest of the community. These open violations are tolerated by the City and Borough Presidents, to enable the political structure to get what they want from the board when they need it, i.e. rezoning requests. In these communities people see term limits as a great opportunity to get rid of these long standing board members and to attempt to integrate and to diversify. 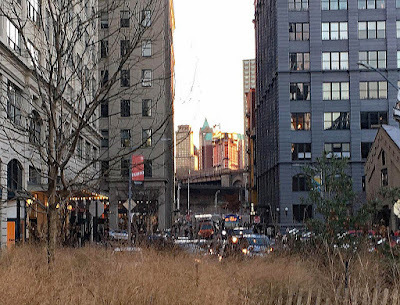 However based upon the experience of a Community Board (CB9) who had a major change in their members over the past four years ago, this may not be the answer, especially if the Borough President has his eyes on that community for rezonings. In Community Board 9, (CB9) Borough President Eric Adams, in 2014, removed the long standing (30 years or more) board members (Jewish and White men), and replaced them with Black folks who had the same agenda and motive - to rezone the community. However, not all of the new board members were apart of that intention and thus we have been successful at least of not having another rezoning request materialize at CB9, despite certain members of CB9 working all kinds of tricks to do so. But our struggle hasn’t been easy, we have had to file at least seven lawsuits, we have demonstrated, we have filed complaints, we have been arrested and have decided to dedicate our entire lives to protecting this community against certain Community Board members who’s intention it is to fulfill Borough Hall’s mandate of rezoning for the real estate industry. In fact, we lost one of our strongest allies, who was the first vice-chair of CB9 because she was a strong opponent against a massive rezoning. She was removed off the board despite being an officer of the board, after only two years of service, whereas there were other board members who had been on the board for over 30 years, still there. MTOPP Says Yes. This was a hard one, because we don't want to see community boards weaken, but if this city wanted true diversity then they would diversify who can place members on the Board. Right now all of the board members are placed there by the Borough President with only the City Council members making recommendations. Having City Council people make those appointments as well as the Borough President could go a long way to diversifying and ensuring that it is not just the Borough President’s agenda that will be followed. What we know however is that true diversity can not happen when only one person is allowed to appoint and remove board members off of community boards and this is not going to change unless people really fight and demand it. In the case of CB9 we do believe that having representatives that are on the board who reflect the majority of the residents in the community has empowered us to at least prevent a massive rezoning, where as if the board was still in the hands of those few we might be writing a different story. 2. to be elected by neighborhood voters, we don't need a Borough President choosing who represents us, like a one-person Electoral College - we know how not to vote for lobbyists or real estate developers. 4. and a new mission and mandate to actually do something relevant to neighborhoods. We see term limits as a good start and we can have them without the creepy civic engagement commission the Mayor wants. We need more reforms as well, but this is one of them. We demand term limits from our elected politicians, why not term limits for our unelected neighbors who pretend to be looking after our interests? Vote YES!